Sometimes if you need to create a number of Hyper-V virtual machines (or even containers), it can be helpful to create a Network Address Translation, or NAT network. NAT is the same technology that is used in consumer WiFi routers. It allows a series of non-routable IP addresses to be bound to a single connection point. In the case of Hyper-V, this connection point is going to be a Hyper-V virtual switch and the underlying virtual Ethernet adapter. 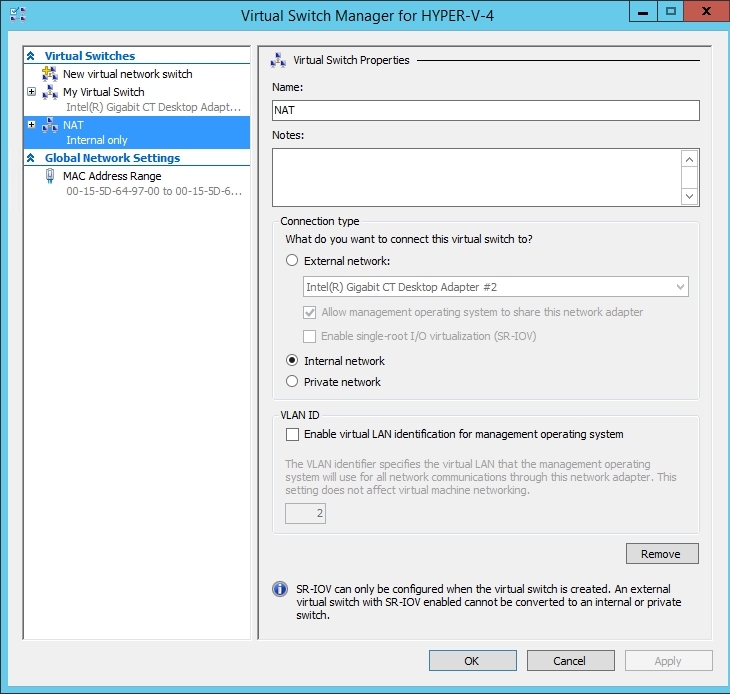 Not surprisingly, the first step in creating a NAT network is to create a Hyper-V virtual switch. Although you can create a virtual switch using the Hyper-V Manager, let’s go ahead and use PowerShell instead. The cmdlet used for virtual switch creation is New-VMSwitch. When you use this cmdlet, there are only two pieces of information that you will need to provide. First, you are going to have to assign a name to the virtual switch. For the sake of demonstration, I am going to call the virtual switch NAT. You can see how this command works in the figure below. Here I have used the Get-VMSwitch cmdlet to display a list of the previously existing virtual switches. I then created the new virtual switch, and then ran the Get-VMSwitch cmdlet again, to show that the newly created virtual switch has been added to the list of virtual switches. 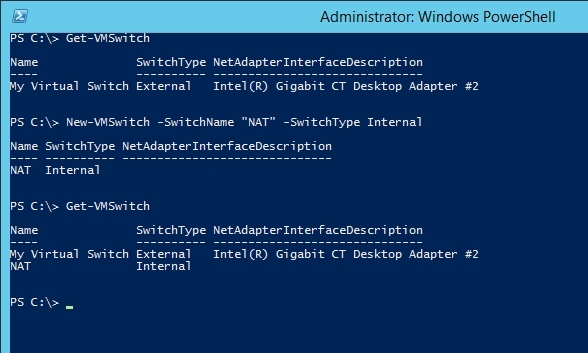 When you create a Hyper-V virtual switch, Hyper-V will automatically create a virtual Ethernet adapter that corresponds to the virtual switch. If you go back and look at the figure above, you can see, however, that my host server already had a virtual switch before I created the NAT switch. Hence, my Hyper-V server has three virtual Ethernet adapters. There is an adapter for the previously existing virtual switch, another adapter for the physical NIC, and a third adapter that corresponds to the NAT switch that I just created. Hyper-V differentiates between these adapters by using an IfIndex value. You can find the IfIndex value for the switch that you just created by entering the Get-NetAdapter cmdlet. If you look at the figure below, you can see my three adapters, and you can see that my NAT adapter’s IfIndex value is 37 (your adapter will probably have a different value). The third step in the process is to create a NAT gateway. In the world of IT, the term “gateway” can mean a lot of different things. In this case, the NAT gateway does not refer to a gateway VM or anything like that. 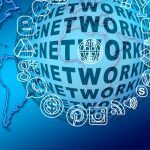 Instead, creating a NAT gateway simply refers to the act of assigning a gateway IP address to the virtual Ethernet adapter that is being used by the newly created NAT virtual switch. 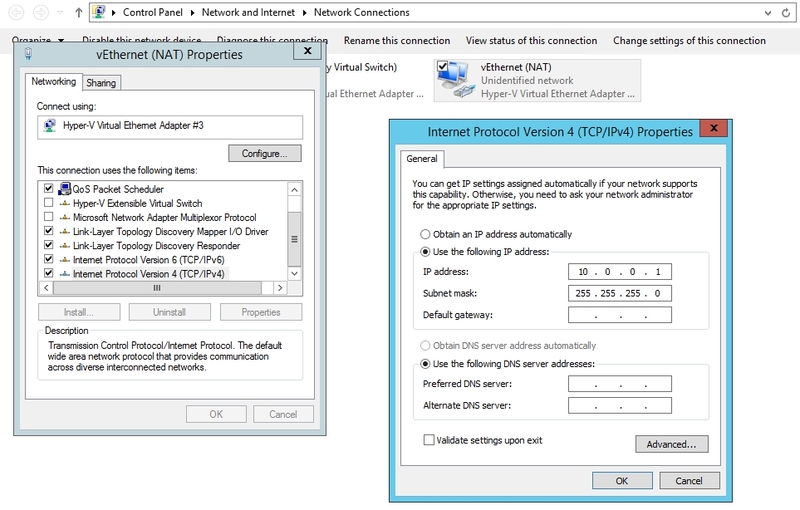 Because we are basing the NAT network around an internal virtual switch, I want to use a non-routable IP address range. Therefore, I am going to use 10.0.0.1 as the gateway IP address. You should use whatever IP address range suits your own needs. As you can see, this command is relatively straightforward, but you will notice that I had to supply an interface index. The interface index is the IfIndex that I looked up a moment ago. The figure below shows what this command looks like when run. So far, all we have done is to create a Hyper-V virtual switch and assign an IP address to the corresponding virtual Ethernet adapter. In fact, you can use the Hyper-V Manager to view the work that we have done in PowerShell. If I open the Virtual Switch Manager, for example, you can see the internal virtual switch named NAT that we created earlier. 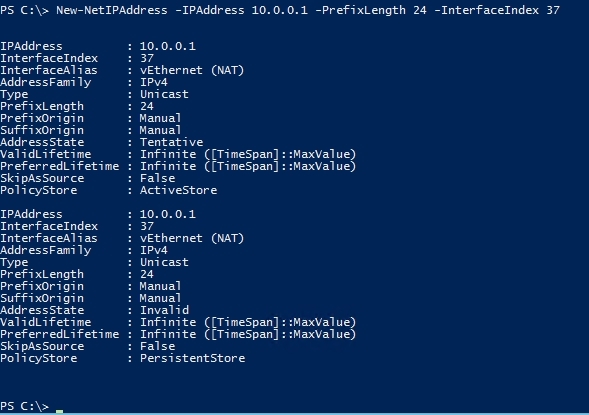 Likewise, we can use Control Panel to view the IP address assignment that we have made through PowerShell. You can see what the NAT creation process looks like in the figure below. At the beginning of this article, I compared a Hyper-V NAT to the NAT networks used by consumer-grade WiFi access points because of the way that these access points provision non-routable IP addresses to network endpoints, and then enable Internet access for those endpoints. There is, however, one key difference between the way that NAT networks work on consumer WiFi access points and the way that NAT works in the infrastructure that I have just shown you how to create. WiFi access points are able to provision network endpoints with IP addresses because the access point is configured to act as a DHCP server. The NAT network that we have just created will not contain a DHCP server until you create one, and therefore will not automatically provision clients with IP addresses unless you add a DHCP server. Thanks for the article. Let me suggest some corrections. 1. I believe you have slightly messed up with screenshots. You missed one that should follow the "[...] at the figure below, you can see my three adapters [...]" statement. So all the subsequent screenshots become "shifted" one step up in the text. 2. You say that "When you create a Hyper-V virtual switch, Hyper-V will automatically create a virtual Ethernet adapter that corresponds to the virtual switch." This may be misleading. From what I know about Hyper-V, this (creating a corresponding vEthernet adapter) is not always the case with 'External' switch type, and is never the case with 'Private' switch type. I just would like to suggest a small fix: New-NetNat should probably have the parameter -InternalIPInterfaceAddressPrefix 10.0.0.0/24.